My momma done told me…(if you sing these next words to the tune of that famous song, this will be more fun.) My momma done told me…to clean up left-overs (but beware, putting melody to these words will make them haunt you, just like the memory of your mother’s voice sometimes won’t leave you). First, pull some leftovers out of the fridge (you save them, right?) We had tacos last night, and had about a 1/4 cup each of leftover chopped peppers and onions, co-jack cheese, quesa fresca, and cilantro. Also, part of a jalapeño, some canned tomatoes (petite diced), and lurking in the corner was 1/4 of a boiled potato needing to be eaten. Before frying, I sprinkle the boiled potato with all-purpose seasoning (Ken makes our house blend; use whichever kind you’re partial to). 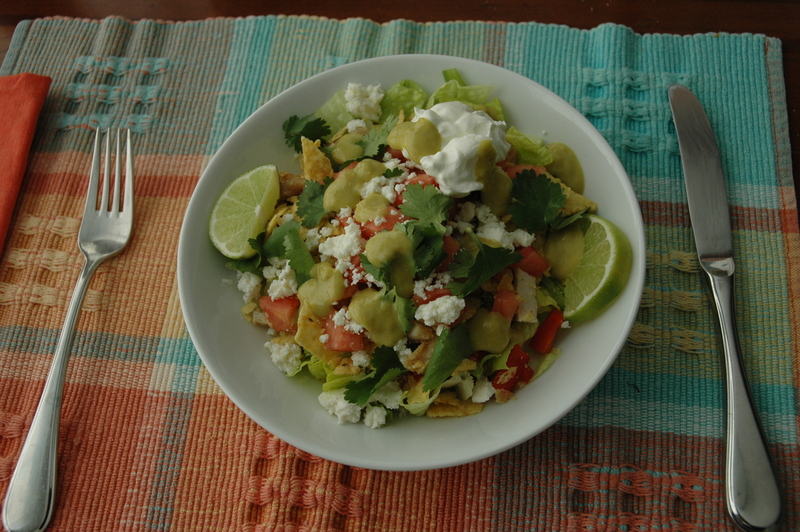 And, if you don’t feel like cooking, put it all on top of a bed of lettuce and make a salad (yes, even the potato). Jump here for a picture of how to turn leftovers into a lunch, pretty enough to invite a friend to. I added one sausage patty to the mix, because my husband thinks meat is one of the basic food groups, and who am I to tell him otherwise? Food is such a personal thing, and he’s significantly older and frequently wiser than I, so I don’t interfere with what he wants to eat. (Keep reading for how I manage to live in harmony with his desire–which might very well be his need–for quite a bit more meat than I want). Pretty leftovers, with 2 beaten eggs. 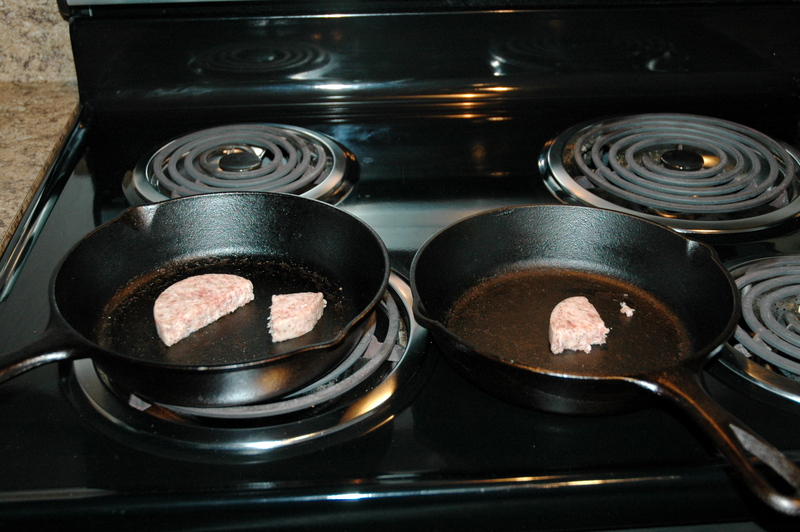 I use two skillets, for customization options. 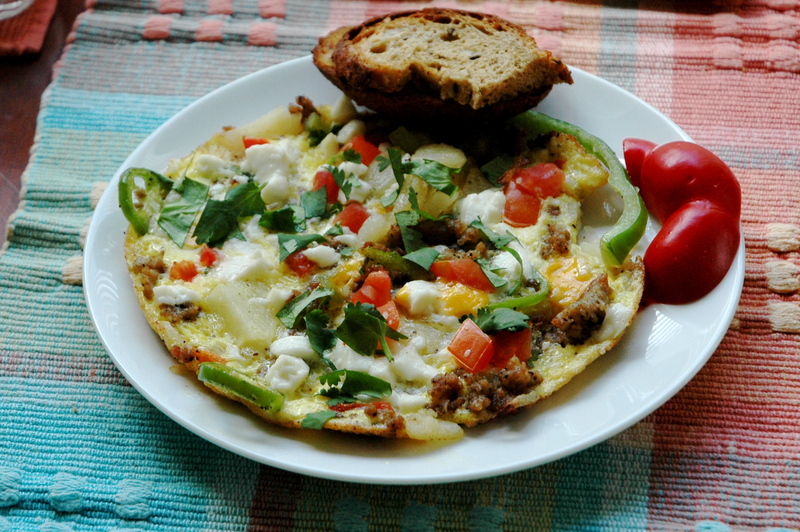 I like sausage, but because I just can’t be as active as energizer-bunny Ken, I need to get the majority of my calories from more nutritional sources–I’ve got a total of about 1/3 of an ounce of sausage in my skillet, and it really zips up the frittata flavor. Yes, I use a little oil. 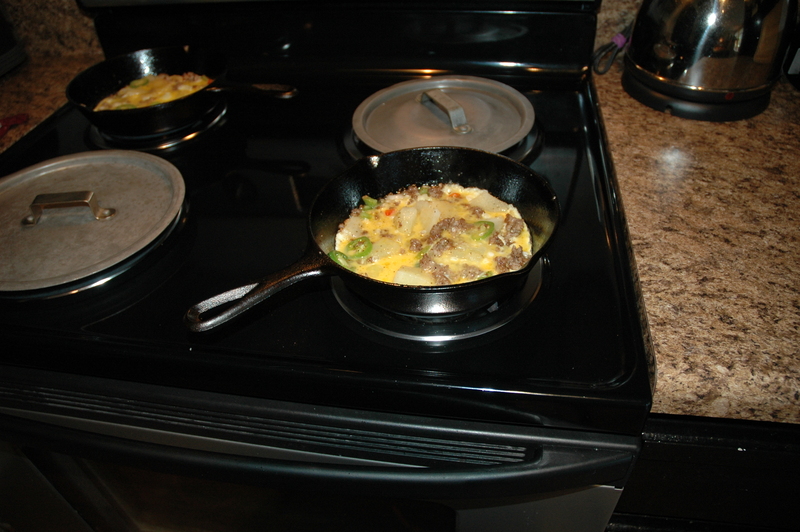 Preheat the oven to 400 degrees F. The frittata will finish in there (so use an oven-proof pan). A small splash of oil helps keep the egg from sticking. 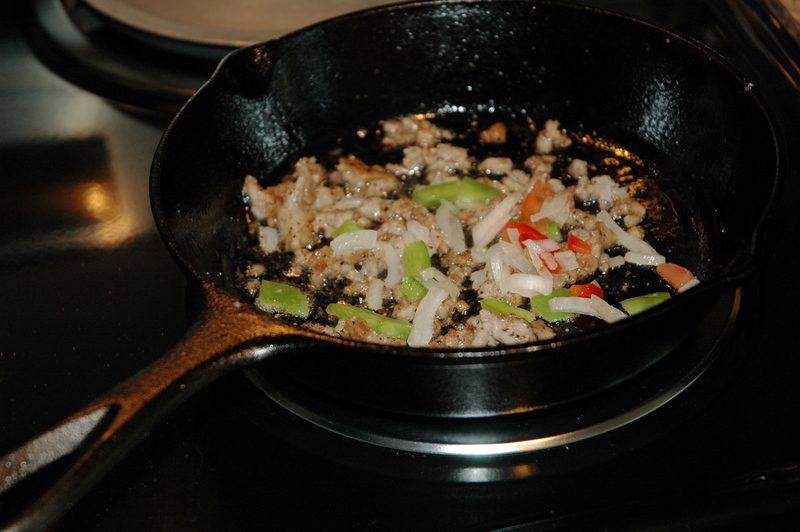 Sprinkle in pepper to taste, (frying the pepper makes its flavor burst!) Brown the meat over medium heat about 2 minutes. 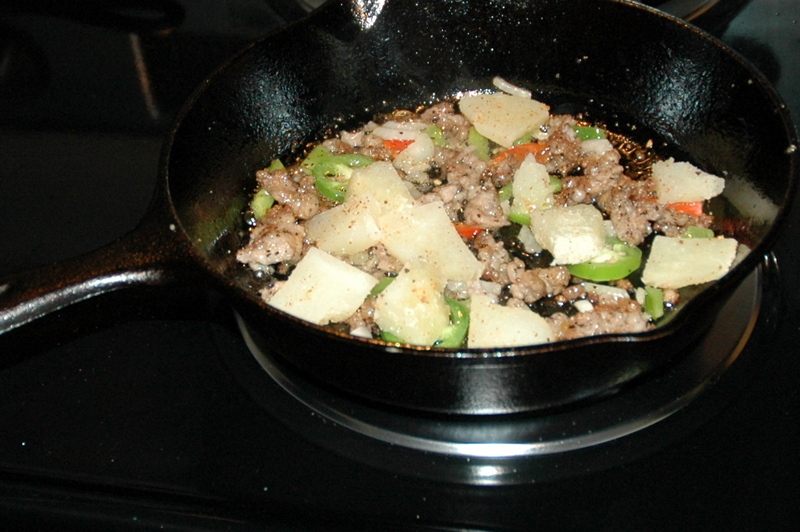 Add the veggies, and then the potato and stir, brown for a minute, and stir again. I’m about 3 minutes into this, (not counting the gathering of leftovers before I started cooking). 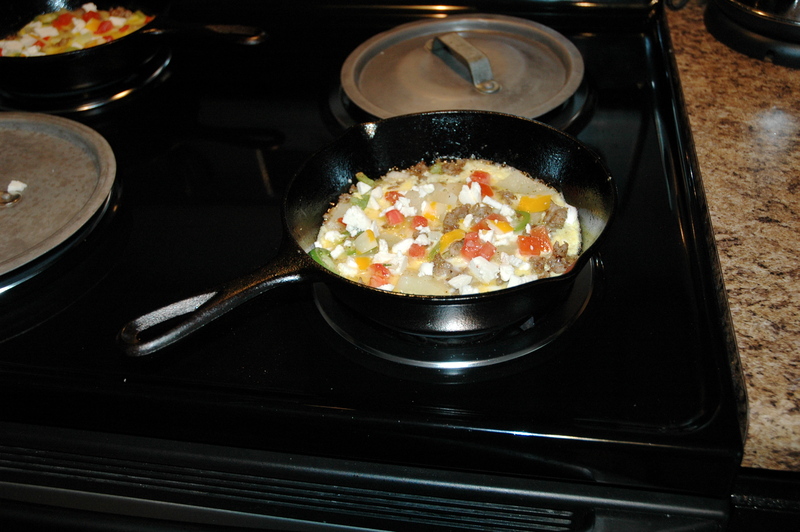 Pour the egg into the pan and swirl (when I’m using cast iron, I hold onto the handle with a potholder). I’m using an electric range, so I turn the burner(s) off now! With the pan(s) still on the burners, arrange the wet and/or sticky ingredients (such as tomatoes & cheese) on top of the eggs. 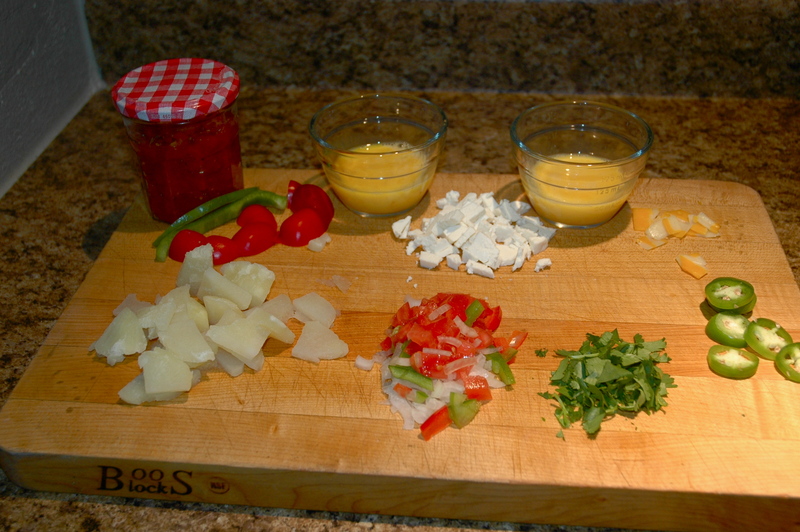 (If you’re using gas, turn the burners off right after you’ve nicely arranged your toppings). Now we’re about 4 minutes into this project. The egg’s all in and swirled. I’m almost a food designer. 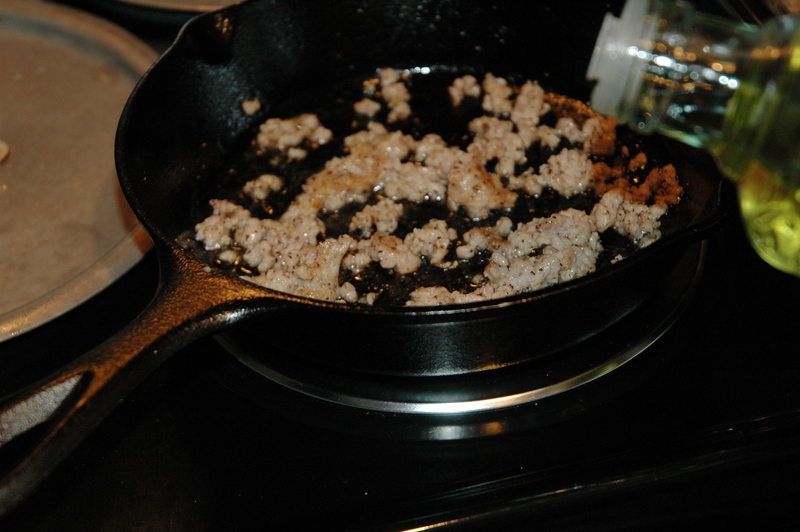 Now, pop the skillet(s) into the preheated oven for 5 minutes. 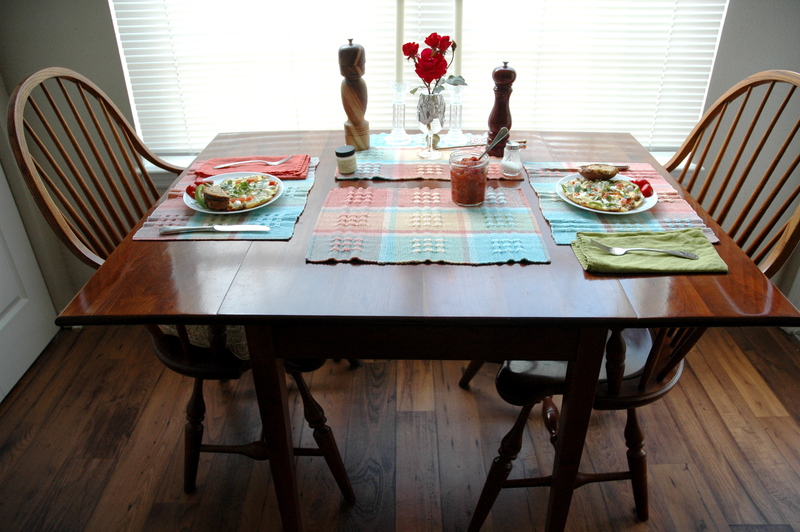 Set the table, and remember to use a potholder when removing the pan from the oven. 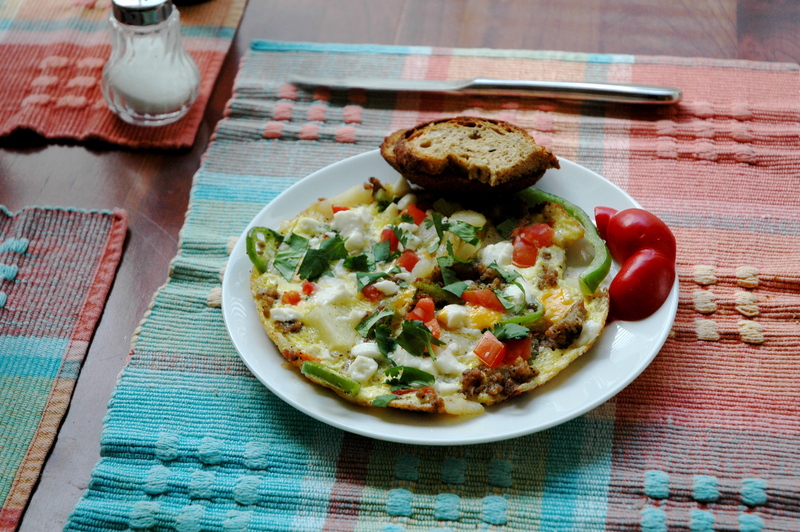 Slide a spatula under the frittata and loosen all the way around. Plate it, sprinkle with cilantro & serve. Maybe you’re wondering about those pan covers on the stove in the pictures above. They keep grease splatters off; I hate it when electric burners, and for that matter, people, start smoking. Every meal is a celebration. I embellish almost every plate with a couple slices of raw veggies, and in this case, also some multi-grain toast. Broccoli, onion, ham & cheese; roast beef, potatoes & carrots; chicken & red peppers; smoked salmon, asparagus & cream cheese, really, anything that you need to use up, even potatoes & potatoes.